This year marks the 8th or 9th year that my hubby and I have hosted Thanksgiving dinner for the family. The Thanksgiving turkey dinner torch was passed to me when my parents retired and started RV-ing full-time. In any given year we have 15-20 people around the table, and always for a sit down dinner. No buffet style serving for Thanksgiving Day. This is my favorite family day of the year. No birthdays are being celebrated, no gifts are being exchanged. This is just a day of family. This is our family feast right before we toasted with Almond Champagne, and of course pink lemonade for the grandson. The menu planning and preparation for the big turkey day were especially fun for me this year. With my new-found Domestic Goddess status, I had lots of time to plan the menu, decorate, and recruit the help I needed with dinner. Now each year what I ALWAYS stress about is the timing of this event. You ladies or gents who get the feast on the table know what I am talking about. The turkey’s done on time, the side dishes heated on time, and the gravy tastes good, on time. Every year I have had the same level of stress as the first year I put this feast together without my amazing Mom. And every year , so far, the feast has come together, on the table, on time. All of the girls in the family contributed amazing side dishes. We had spinach bake, sweet potato casserole, creamy mashed potatoes (with real cream cheese), green bean casserole, steamed green beans with bacon, mushrooms and onion, and of course the usual stuffing and gravy. 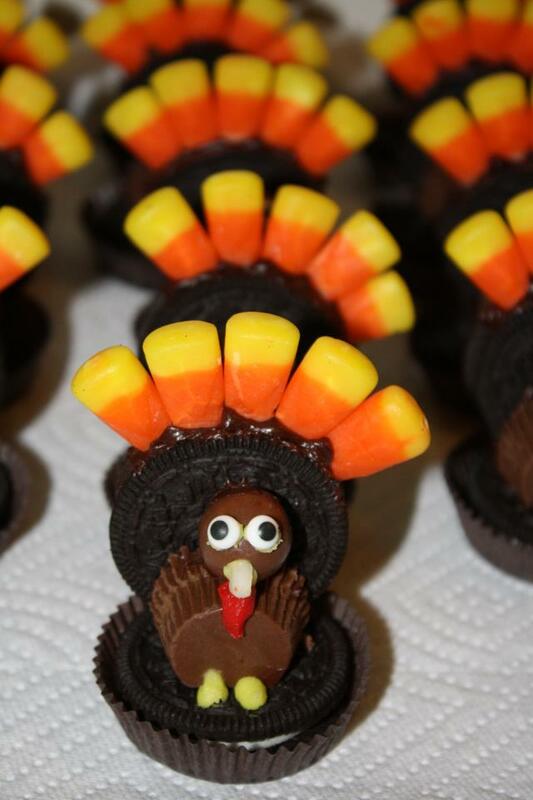 We also had these amazing little turkey’s, created by my brother’s girlfriend, Elaine. She made hens and toms. Very cute and yummy. Grandson Evan tried to sneak a few extras off of the table for himself. After the stomachs’ settled from dinner there was Xbox Kinect in the living room, or an intense card game called Phase 10. I love having the activities for a big crowd. The only thing we didn’t get a chance to play was the Wii bowling. We’ll save that tournament for Christmas time and our New Year’s Eve party. We always miss our long distance family at this time of year. My sister, Laura and her husband in Montana; my grandparents in Illinois; and our nephew, Jim, in San Luis Obispo. Thank goodness we can hook up on Skype whenever we want too. We hope that each and every one of you had an amazing family day like we did. These are the moments that you hold dear in your heart, and for me personally the traditions that I love to be a part of creating.